ISLAMABAD: The counsel of Foreign Minister Khawaja Mohammad Asif on Monday sought time from the Islamabad High Court (IHC) for submitting a rejoinder on a petition seeking his disqualification for holding a UAE Iqama. A three-member bench headed by Justice Athar Minallah heard the petition filed by a Pakistan Tehreek-i-Insaf (PTI) activist, Usman Dar. Dar had lost the elections to Asif in May 2013. He filed the petition seeking the disqualification of Mr Asif relying on a July 28 judgment of the Supreme Court regarding receivable salary, on the basis of which the apex court disqualified former prime minister Nawaz Sharif. The petition said that Mr Asif was entitled to draw a salary which was his receivable asset; however, since he did not declare it in the nomination form while contesting the 2013 general elections from NA-110, he did not qualify to remain a member of the National Assembly. The petition claimed that Mr Dar had recently learnt about the Iqama, or work permit and salary details of Mr Asif and therefore, he has only now moved the IHC against the minister. 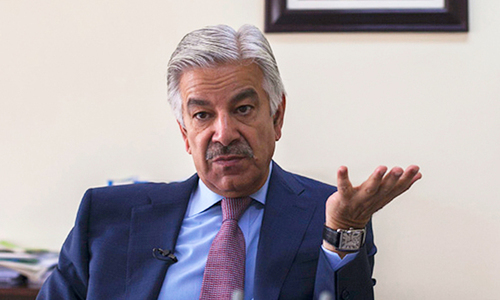 The petition pointed out that the Iqama was renewed on June 29, 2017 and it was valid till June 28, 2019 which established that in spite of being a federal minister, Mr Asif “intends to surreptitiously and secretly continue with his full-time employment with IMECL in violation of his oath of office under the Constitution of Pakistan”. According to the petition, Mr Asif was not only a full-time employee of the IMECL in 2013 when he was holding the portfolio of the federal minister for water and power, but in the past while the PML-N was in the coalition government of the PPP, he was a federal minister till the time his party parted ways with the PPP. He concealed his job and right to receive a salary while filing nomination papers for both the terms, it added. Earlier, Asif has submitted a reply to the petition saying that the petitioner has concealed from the court that the issue related to Iqama has not only be adjudicated by the Election Tribunal but the Supreme Court also decided this case in Asif’s favour. It said that the petitioner has relied upon all those documents which Asif has already submitted to the returning officer at the time of filing of nomination papers in 2013. It further said that the Dar has approached the IHC by concealing material facts. The conduct and motive of the petitioner is based on mala fides. According to his reply, till the tax year 2011-2012, he received AED50,000 and declared it as foreign income in the nomination papers. During Monday’s hearing, upon the court’s query, Asif counsel said that his client has declared all the foreign income, Iqama and other relevant details in the assets declaration form while filing nomination papers to contest the May 2013 general elections. The court adjourned further hearing in this case till Tuesday. On March 22, PTI chairman Imran Khan criticized the IHC over slow progress in the Khawaja Asif case which was pending since July last year. “The Islamabad High Court is not hearing his case. They keep on giving month-long adjournments and then they change the composition of the bench. They heard the case for nine months, and at the end, they changed the composition of the bench. Is this justice?” Mr Khan had asked. Over 16,500 cases have been pending with the IHC for several years. Its straight forward case of disqualification of our foreign minister. I just don't know why IHC is taking so long in reaching a verdict. How can a full time minister of Pakistan be drawing a salary from another organization of a foreign country while being minister and taking salary from goverment of Pakistan ? 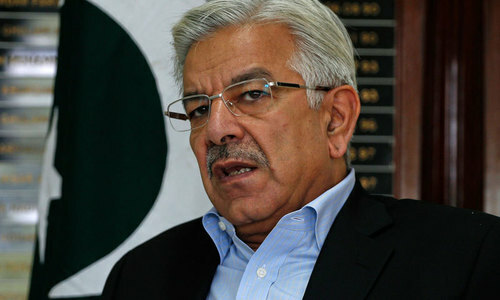 Question is whether Khawaja Asif Pakistan's foreign minister or that of UAE or some other country ? Even the US has stopped talking with him. 80% of people elected in assembly are high rated crooks. What does the people and country expect from them. As usual, delay tractics are being applied to buy time and influence final decision. This is typical and very common in Pakistan! @Dr Khan Imran Khan wants everybody either disqualified or leave the country so he can win easily and then ask his MNA’s to give votes to somebody in Baluchistan for PM job.